Andre Cushing will finish his service as a state senator in the coming weeks, but the Newport Republican will continue his tenure in public office. Cushing won a special election Tuesday to serve as Penobscot County commissioner representing District 2, which covers southern and western parts of the county. He had been serving as a county commissioner since the August death of County Commissioner Tom Davis. Gov. Paul LePage had appointed Cushing to take Davis’ place. Cushing is finishing his third term in the state Senate, and he was the assistant majority leader in the chamber until he stepped down from that leadership position in October of last year. He announced in February that he wouldn’t run for re-election to the Senate. 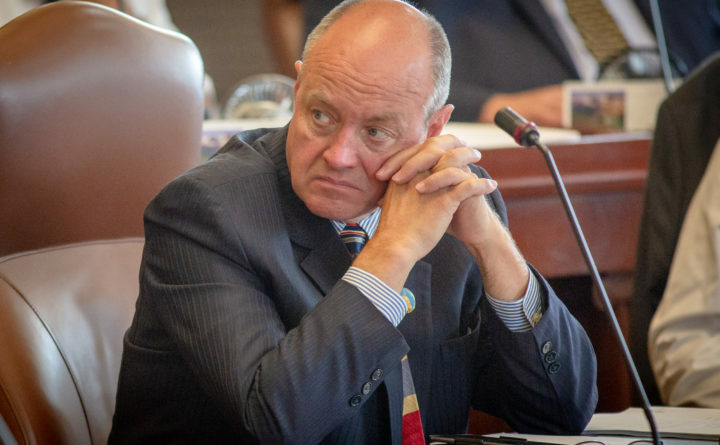 Those decisions followed a Maine Ethics Commission investigation into Cushing’s campaign finance activities that started in 2016 after his sister accused him in a civil lawsuit and a complaint to the commission of misusing family business funds and commingling some of that money with campaign funds. In August 2017, the commission levied $9,000 in fines against the political committee run by Cushing for 11 finance reports that were filed late between 2014 and 2016. With 19 of 20 precincts in the commission district reporting unofficial results to the BDN, Cushing led Democrat Donovan Todd and Libertarian Donald McCann with 59.9 percent of the vote. Todd had 30.9 percent of the tally, and McCann had 9.2 percent of the vote. Republican state Rep. Stacey Guerin of Glenburn won her bid to replace Cushing, defeating Democrat Bill Lippincott, according to unofficial results reported to the BDN. In another Penobscot County commission district, incumbent Commissioner Laura Sanborn, an Alton Democrat, was leading Republican Jeffery Gifford in her re-election bid. With 35 of 38 precincts reporting results to the BDN as of midafternoon Wednesday, Sanborn was leading Gifford with 50.9 percent of the vote to Gifford’s 49.1 percent. In the race for county treasurer, incumbent Dan Tremble, a Democrat who also serves on the Bangor City Council, held a tiny lead over Republican John Hiatt, who won a seat on the Bangor School Committee in Tuesday’s election. With 60 of 64 precincts reporting results as of midafternoon Wednesday, Tremble led Hiatt by just 31 votes out of more than 60,000 cast. The races for other county offices were uncontested. Sheriff Troy Morton and Register of Deeds Susan Bulay, both Republicans, will return to their positions. Democrat Amy Faircloth will replace current Probate Judge Ray Bradford, a Republican.